The vineyards around Alba produce the most famous Piedmont wine. The great Barolos and Barbaresco wines made from Nebbiola grapes. These are some of the best Italian wines and are available online through our sister site - click here for more details. Barolo is one of the most famous of all Italian wines. This wine is produced in a carefully defined territory just south of the Tanaro River, The wine has a bouquet of violets and a smooth velvety flavour with a slightly resinous aftertaste - known as goudon or tar. Barbaresco, comes from steep slopes surrounding the ancient town of that name, another "big" wine - a younger sibling of Barolo wine if you like - and it matures quicker. Wine from the north of the Tanaro is simply called Nebbiolo and this wines has a violet fragrance which is characteristic of this Italian grape variety. Nebbiolo wine vintages are lighter and the wines can be drunk young. 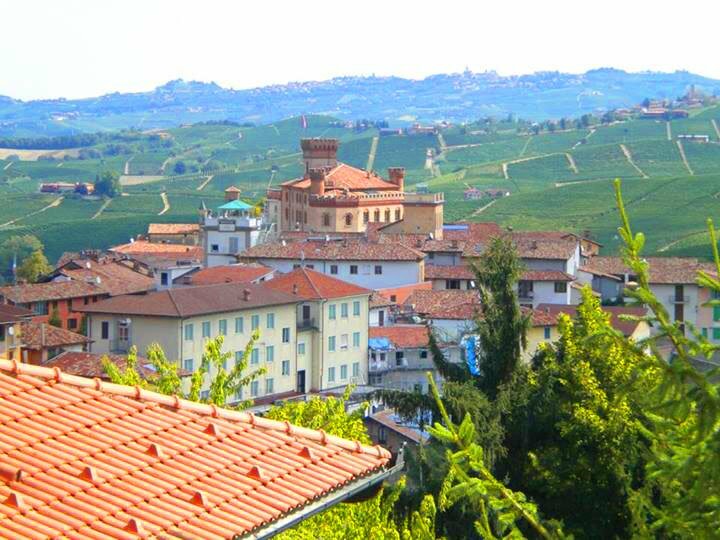 Barolo in the Langhe wine region of Piedmont. Piedmont wines are predominately red. But among the Piedmont white wines, Asti Spumante has become famous. Nowadays Asti Spumante is probably Italy's best known sparkling wine and nowadays it isn't nearly as bad as you think. Unfortunately in the "80s" the market was flooded with cheap and nasty Asti Spumante and the reputation of the name was destroyed. The best of the Piedmont white wines though is the Gavi. A superb wine. Particularly good are those produced by Tenuta San Pietro. Vermouth is another Piedmont specialty which was first produced, commercially at least, in 1786 by wine maker Benedetto Carpano at his wine shop near the Turin Stock Exchange. In those days the vermouth producers were small family affairs. Now they are mammoth distilleries and global businesses whose secret formulas are jealously guarded. More than 50 million bottles of Italian vermouth are consumed every year, and the classic cocktail, dry martini, is named after the most celebrated producer: Martini & Rossi is now a household name throughout the world but Martini Rossi has stayed true to their Piedmont roots. The best way to experience all that Piedmont has to offer is by means of a tour around Piedmont's wine route sampling these fantastic wines.